This is set in Britain at the time of the Roman occupation when Hadrian's Wall is being built. The Wall is creating great tension between the locals, many of whom have been relocated from farms that have been in their families for many generations, and the occupying forces. Gaius Petreius Ruso is a doctor and together with his wife, Tilla, a local born Briton and a healer, they do their best to minister to both Romans and Britons. Tilla has used the opportunity of Ruso's posting to make tentative contact with some local people who knew her family who were killed in the raid when she was originally taken as a slave. 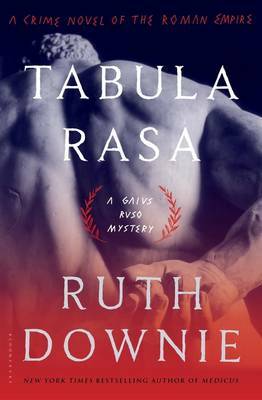 When the family’s son disappears after rumours that he saw a body being hidden in the Wall, Ruso and Tilla cannot help being drawn into the search. Problems escalate as the locals are convinced that the soldiers know more than they are saying and are not using all their resources in looking for the child. Meanwhile Ruso's concerns for his missing clerk, Candidus, grow as no-one but he seems to take the situation seriously. The author's awareness of historic time and place comes through very clearly. Her knowledge and understanding of the period really enhances the book. She has the ability to explain historical terms when necessary without slowing down the pace. There is a humour in the book which I found appealing as well as a lightness of touch when describing characters that make it very easy to visualise them. A very enjoyable read. Ruth Downie is a new author to me and although this is the sixth book in the series, it stands alone quite easily. I do intend to read the others in the series as soon as I can. If you enjoy Lindsey Davies and Steven Saylor, then you might well enjoy this.